Are those words familiar? Low back pain is, statistically speaking, an issue most of us deal with in our lifetime1. But you don’t want back pain to slow you down – so what can you do when it happens? First, as the Movement Maestro has said, “don’t guess, get assessed”. All low back pain is NOT the same. Now that’s out of the way, here’s a modification you can make if your back hurts when you squat. Swap the weight to the front. 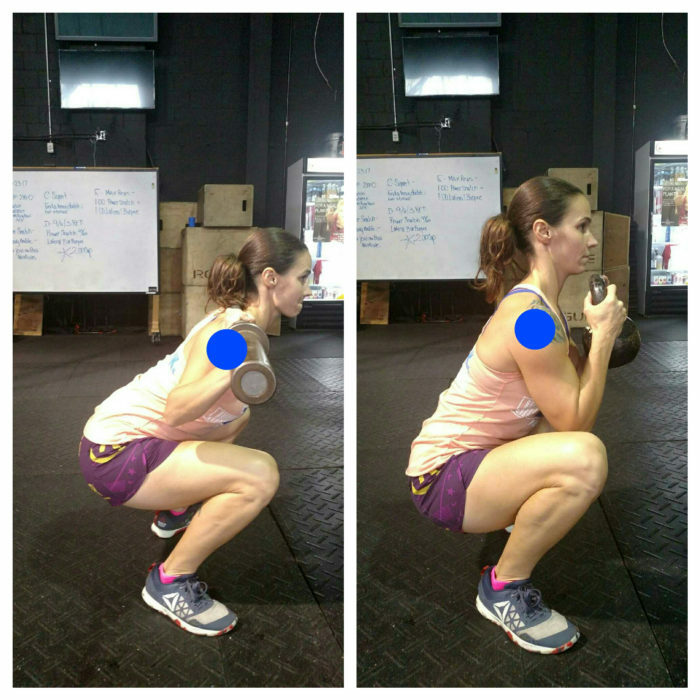 A front squat (or a goblet squat) acts as a counterbalance and deloads your back. Also, if over-arching your back as you squat is a problem for you, it’s gonna be a heck of a lot harder to do with your center of mass in the front. Check out November’s model, Michaela, in the picture below. On the left, the weight is right next to her center of mass (blue dot) and her back is more arched. On the right, the weight is further in front compared to the blue dot and her back is in a nice neutral position. For more like this, sign up on Wodify for our Back Pain Explained Workshop on November 12.